This collection of monologues is comprised of 50 monologues for girls and 50 monologues for guys. 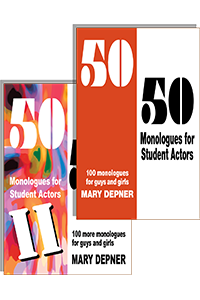 Each set of monologues has enough variety to challenge any skill level. The different situations, styles, and voices make it easy for actors to find a monologue they can relate to. This collection is perfect for classroom practice, auditions, and competitions. Titles for girls include: The Runaway, The Betrayal, Love at First Sight, Sixteen Candles, A Central Park Moon, Talking to Myself, Our First Kiss, and more. Read more...Titles for guys include: I Saw Everything, Double Standard, Paranoia, Self-Fulfilling Prophecy, The Prom or the Tires, Spring Break, The Middle Child, and more. Like the first volume, this collection of monologues is also comprised of 50 monologues for girls and 50 monologues for guys. Unlike other monologue collections where they are all about the same length and have a similar voice, these monologues have enough variety to challenge any skill level. Selections range from one to five minutes and include comedy, drama, and everything in between. The different situations, styles, and voices make it easy for actors to find monologues to which they can relate. This collection is perfect for classroom practice, auditions, and competitions. SPECIAL OFFER! Buy both books for $25.00! A unique thing about this monolog book is that the duologs and triologs show two or three perspectives of a situation, each presented as a monolog.